Learn about updates to the website, subscribe to Anahareo news, or share your own stories! The purpose of this forum is to allow G & A fans worldwide to stay in contact with each other, to stay on top of G & A news, and to share your stories. In order to protect our users and the forum from spam, you will be required to register and login in order to post to the forum. However, you may subscribe and / or browse all forum posts without registering. Have a question or comment? Want a new category in which to post? Please do not hesitate to contact us, and we will do our best to address any issues you may have. 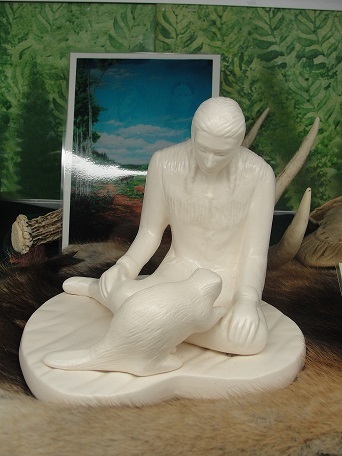 does anyone have any information about a sclpture of Grey Owl with a beaver. Thanks for taking the time to share any info! Hi Penny, sorry for the delayed reply. If you are referring to the sculpture that Anahareo made, there were only 50 of these statues made before the mold was destroyed. There is one on display at the Mattawa Museum; you can find their details in the "Links and Resources" section under "In person." They may be able to assist you further, depending on the nature of your query. Hope this helps! 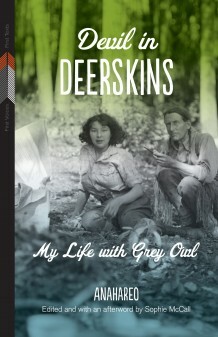 In April 2014, the University of Manitoba Press will be republishing a critical edition of Anahareo's bestselling 1972 book, "Devil in Deerskins: My Life with Grey Owl," which tells the story of her marriage to Grey Owl, their extensive travels through the bush, and their work towards environmental and wildlife protection. This new edition includes forewords by Anahareo's daughters, Katherine and Anne, and an afterword by Sophie McCall, Associate Professor of English at Simon Fraser University (SFU). Notably, "Devil in Deerskins" is the first in the University of Manitoba Press's "First Voices, First Texts" series, which aims to republish Aboriginal-authored works that have fallen out of print. The official press release and schedule of launch events will be posted here as soon as they become available. News & Events: Share news or information about upcoming events related to the Grey Owl and Anahareo. Please be considerate of fellow forum users and refrain from posting advertisements for for-profit businesses. Our Stories: Share your story about Grey Owl or Anahareo, whether you knew them or whether they just touched your lives. Buy, Sell, Trade & Find: Seek or offer difficult-to-find items related to Grey Owl and Anahareo. The forum is only intended to bring interested parties together, and we do not guarantee or verify the authenticity of any item, buyer or seller. Users should note that all transactions are undertaken at their own risk. It is further recommended that any transaction be completed through an established and reputable online exchange forum.